In 1979, Simon Aronson gave the world of magic an incredible tool - A Stack To Remember - which has come to be known as the "Aronson stack," a seemingly random arrangement of cards that has amazing miracle properties built into it. Many magicians have avoided adding memorized deck work to their repertoires because of the daunting task of committing a stacked deck to memory. Struggling to grasp the associations of the cards and their locations within the stack, most quit after a few hours or days. I was the same way... until a Harry Anderson manuscript got me to thinking about how to make this process easier. PMS, my Peg Memory System, was born. Suddenly, I found that it was not only easy but fun to commit the stack to memory (I myself learned the stack in an hour while driving)! 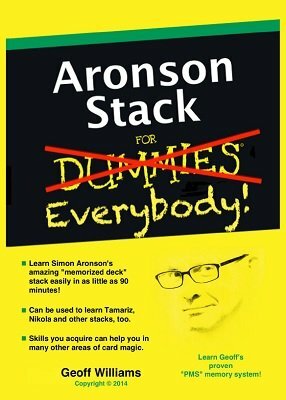 Aronson Stack for Everybody is a streamlined, graphical method for easily and quickly learning the Aronson stack (all with Simon's stamp of approval). BTW, this same technique works great for every memorized stack out there including Mnemonica by Juan Tamariz, The Six-Hour Memorized Deck by Martin Joyal, the Nikola stack and others. Even though there are no actual tricks taught in this manuscript, it does contain links to several free memorized deck tricks and other resources (including a free e-book from Simon Aronson himself)! Please refer to the writings of Aronson, Tamariz, Close and others for the many uses of this incredible tool. "I can't thank you enough for sharing your PMS with us. I GOT this! I never thought I would be able to do this, but I actually memorized a stacked deck! I tried several times [with other systems] to commit a stack to memory, and failed miserably each time. It was a tedious struggle, and I got frustrated because I kept backsliding. Eventually, I lost interest. NOW, because I can recall the card/position, I can see the light at the end of the tunnel. Eventually, I will be able to say I mastered a stacked deck, and it will be because of YOU. Thank you SO much!" - Darryl H.
1st edition 2014, 70 pages.